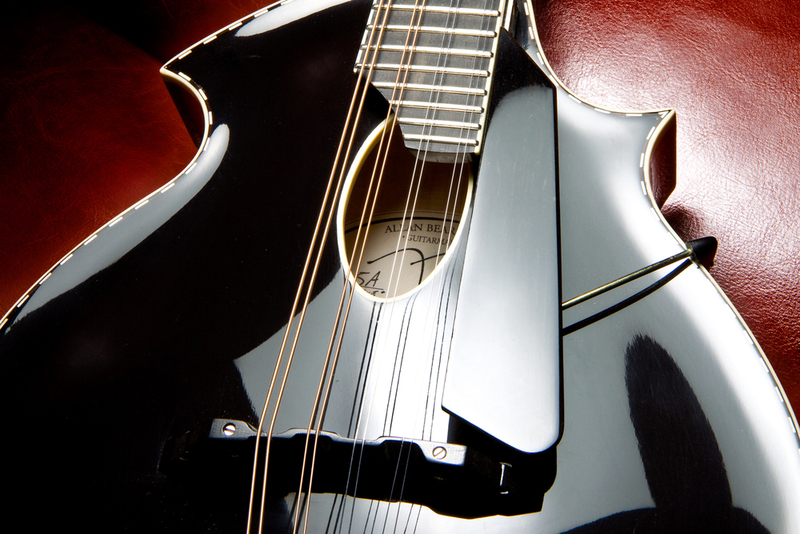 Deep-bodied mandolin, with fingerboard width & spacing adjusted with the guitarist in mind. Back in the early 90′s I was playing guitar and mandolin in several bands, trying to make a living. Which is to say that I was also working as a cabinet maker’s assistant. I was getting a lot of gigs playing mandolin as it was around the time that Irish and Scottish music was gaining popularity. I needed a better instrument, and looking around the workshop, I thought how hard could this be. 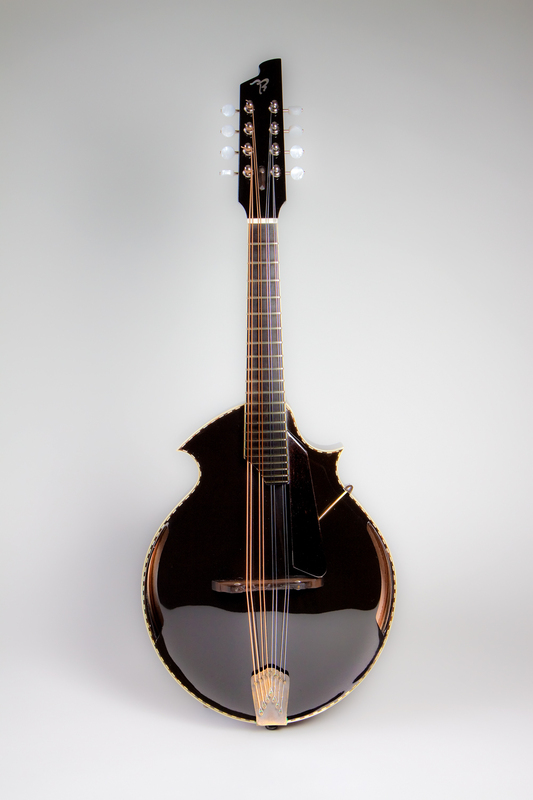 I actually started out building a mandolin – an F5 that I still use to this day. 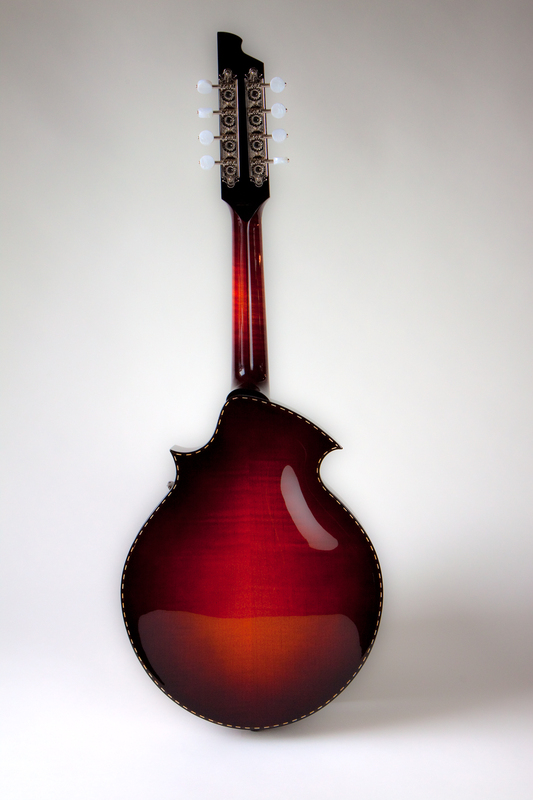 The A style (the round hole gibson A-style) was more suited to the open comping as opposed to the percussive muted style of bluegrass comping. I made mostly A-style oval holes later, with side ports, even though my earliest musical training was on violin, I have adjusted the fingerboard width and spacing with the guitarist in mind. The body is a little deeper, also to expand that percussive ‘chunk’ on the low strings. The 6B – My friend, musician and luthier Jeremy Hamm, suggested that I start doing some with f-holes, presumably to appease his blue grass leanings. I had to do it my way and borrowed an idea from my electric guitars – the ‘edge-ports’. It seemed like a good fit. Lovely resonate projection and a design reminiscent of Kay Krafts of the 50′s and 60′s. Parallel = warmer mid volume.